Creamy no-bake coconut cheesecake sits on top of a chocolate graham cracker crust. 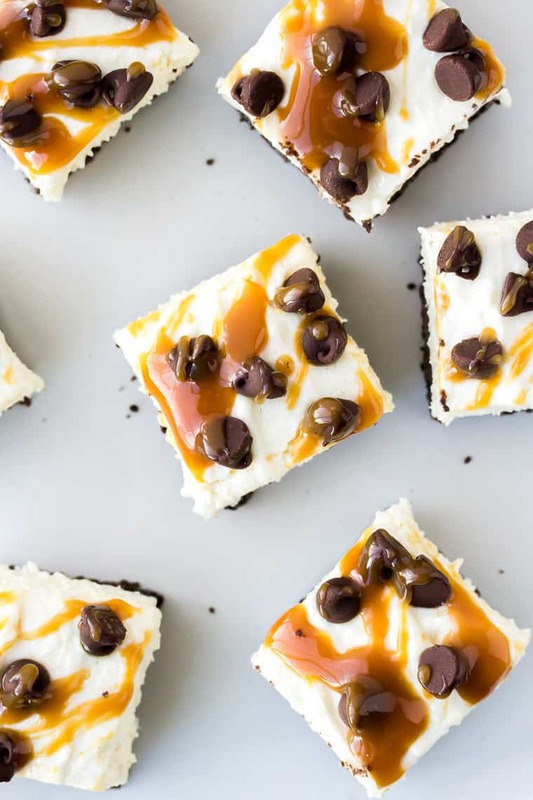 Sprinkled with chocolate chips and drizzled with salted caramel sauce, these Coconut Cheesecake Bars are an easy-to-make decadent treat! The year is coming to an end, and all of the healthy dieting is about to begin. I obviously thought this was a great time to get in as many new dessert recipes as possible. That, and because I’ll be back on that healthy eating train as well, I like to get it all in before I cut it all out, if you know what I mean. So, that brings us to this recipe for Coconut Cheesecake Bars. But, these aren’t just any Coconut Cheesecake Bars. Oh no. 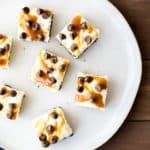 These Coconut Cheesecake bars have a crunchy, chocolate crust and are covered in chocolate chips and salted caramel sauce. Decadent is the word that keeps popping into my mind when it comes to this recipe. And, before you click away thinking that a recipe for Coconut Cheesecake Bars would be too complicated to make, stop. Stop, stop, stop! This cheesecake is no-bake! And, to keep this a super easy recipe that anyone can make, I totally took the store-bought salted caramel sauce short cut too! Now, if you want to buy a pre-made chocolate pie crust, go right ahead, but then you’ll have something more like Coconut Cheesecake Pie? If you want legit Coconut Cheesecake Bars, you’re going to have to bake the crust yourself. But it’s quick and easy, I promise. The hardest part about this Coconut Cheesecake Bars is the fact you have to wait at least 4 hours for it to set up. My advice is to make it when you’re super full, or right before you go bed. You will want to set your cream cheese out to come to room temperature for an hour or two before you begin making this recipe. 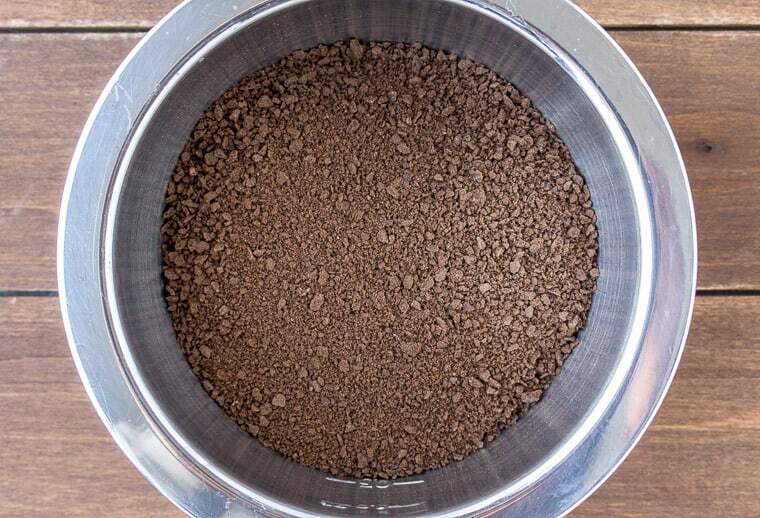 If you are making your own graham cracker crumbs, break up the full chocolate graham cracker sheets and put them into the bowl of a food processor. Pulse until they become fine crumbs. When you are ready to being assembling the bars, preheat your oven to 350°F. If you are using a pre-made crust, skip this step as well as the following instructions for how to make the crust. Mix the chocolate graham cracker crumbs, granulated sugar, and melted butter until all the crumbs are moist. 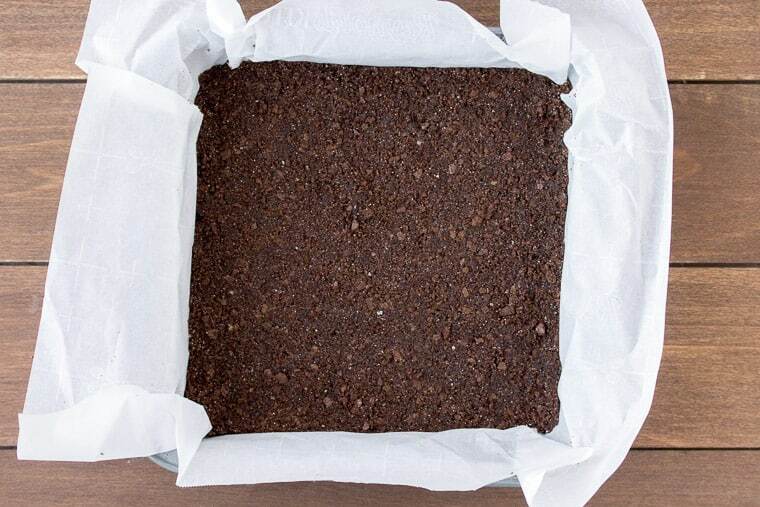 Press the mixture into the bottom of an 8-inch square baking pan. I recommend lining the pan with parchment paper or aluminum foil. It will make removing the bars much easier. To make the no-bake coconut cheesecake, beat the cream cheese in the bowl of an electric mixer on medium speed until fluffy. Reduce the speed to low and slowly add the condensed milk and mix until fully incorporated. Finally, mix in the vanilla extract, unflavored gelatin, and shredded coconut. Pour onto the cooled chocolate graham cracker crust. 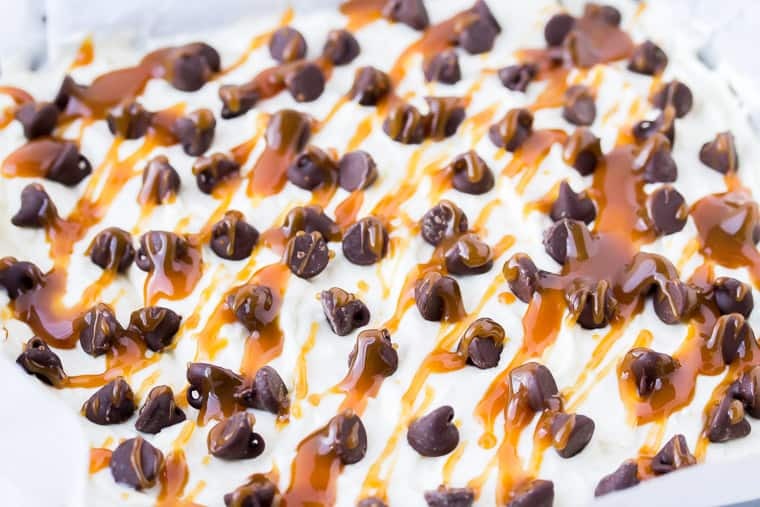 Sprinkle the chocolate chips all over the top of the cheesecake and drizzle with the salted caramel sauce. For the salted caramel sauce, you can buy a jar at the store or make your own. Remove the bars from the pan by lifting up the parchment paper. Place on a cutting board. Cut into squares and serve. This is easier and less messy if you freeze the bars for an hour or two before cutting. To make your own graham cracker crumbs, break up full chocolate graham cracker sheets and add them to the bowl of a food processor. Pulse until they resemble fine crumbs. It will take about 14 full sheets of graham crackers to get 2 cups of crumbs. You can use store bought chocolate graham cracker crust to make this a completely no-bake coconut cheesecake recipe. Adjust the amount of toppings to suite your own tastes. Freeze the entire pan of Coconut Cheesecake bars before cutting to make cleaner slices. Let them softened some before serving. This recipe has not been tested with reduced fat cream cheese or condensed milk. If you use these, the results may not be ideal. Store extra Coconut Cheesecake Bars tightly covered, in the refrigerator for up to 5 days. These Coconut Cheesecake Bars can also be stored in the freezer for up to 6-8 months. Love this recipe for Coconut Cheesecake Bars? Follow us on Pinterest, Instagram, and Facebook for more! Coconut Cheesecake Bars sit on top of a chocolate graham cracker crust. Sprinkled with chocolate chips and drizzled with salted caramel sauce, they are an easy-to-make decadent treat! Break up the full chocolate graham cracker sheets and put them into the bowl of a food processor. Pulse until they become fine crumbs. Mix the chocolate graham cracker crumbs, granulated sugar, and melted butter until all the crumbs are moist. 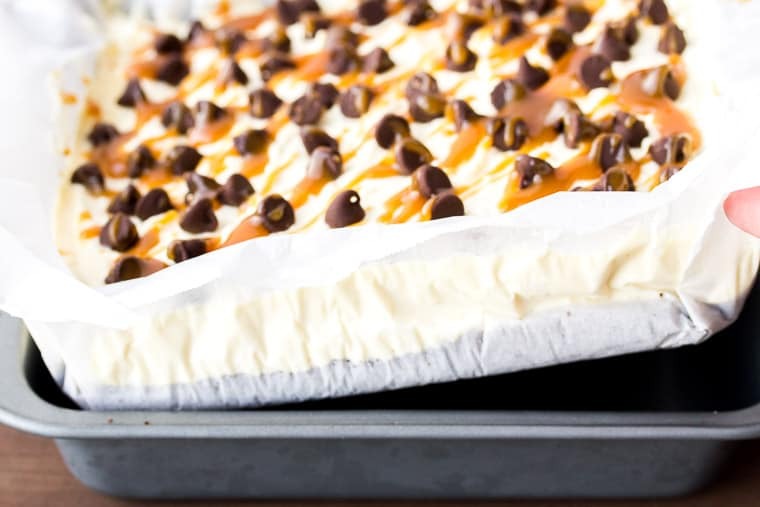 Press the mixture into the bottom of a parchment paper or aluminum foil-lined 8-inch square baking pan. Bake for 10-12 minutes, until firm. Let cool. 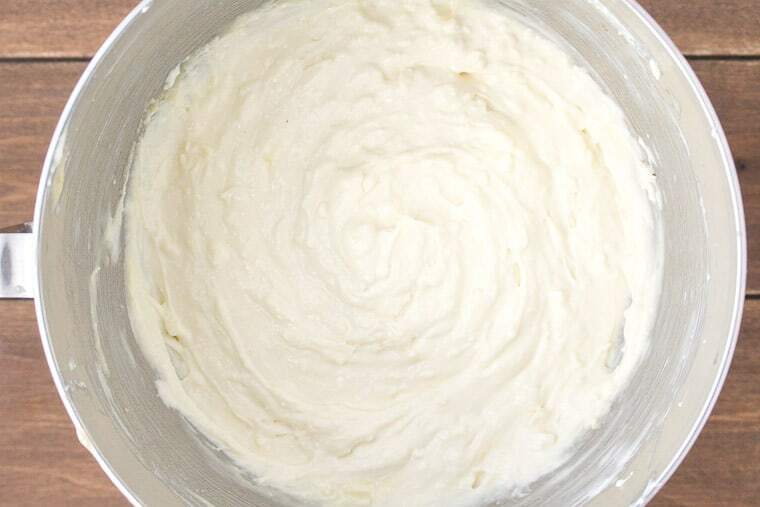 Beat the cream cheese in the bowl of an electric mixer on medium speed until fluffy. Reduce the speed to low and slowly add the condensed milk and mix until fully incorporated. Finally, mix in the vanilla extract, unflavored gelatin, and shredded coconut. Pour onto cooled chocolate graham cracker crust. 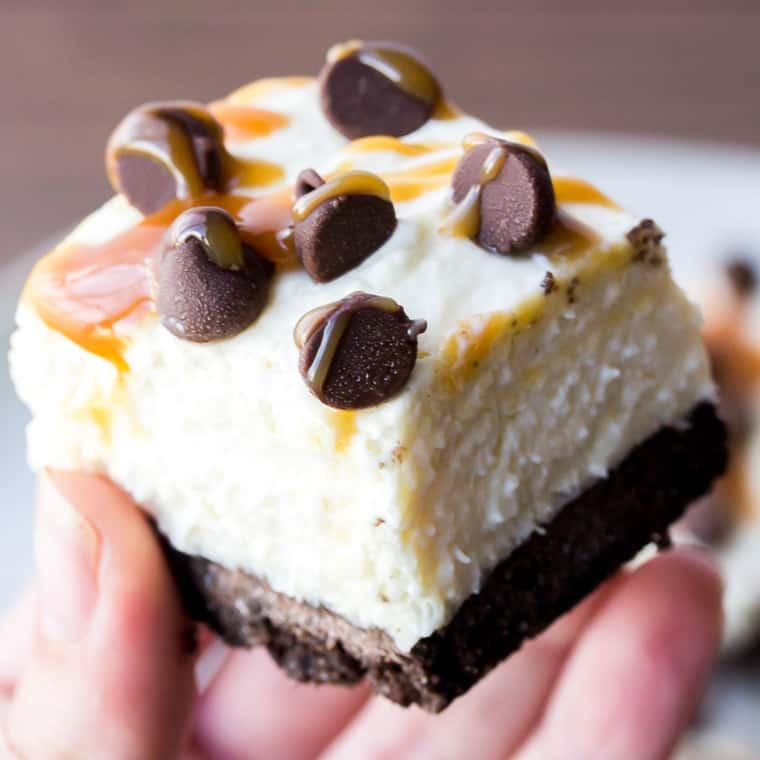 Sprinkle the chocolate chips all over the top of the cheesecake and drizzle with the salted caramel sauce. To make your own graham cracker crumbs, break up full graham cracker sheets and add them to the bowl of a food processor. Pulse until they resemble fine crumbs. It will take about 14 full sheets of graham crackers to get 2 cups of crumbs. You can use store bought crust to make this a completely no-bake coconut cheesecake recipe.